Zurich, Switzerland, November 6, 2013: Adecco Group, the world’s leading provider of Human Resources solutions, today announced results for Q3 2013. Revenues were EUR 5.0 billion, flat in constant currency compared to the same quarter last year. The gross margin was 18.7%, an increase of 80 bps. Continued strong cost control resulted in 2% lower SG&A, in constant currency and excluding restructuring costs. The EBITA margin excluding restructuring costs was 5.5%, positively impacted by a benefit of approximately 50 bps relating to prior periods. Net income was up 61% to EUR 191 million and basic EPS increased by 71% to EUR 1.06. Q3 2013 revenues of EUR 5.0 billion were down 5% year-on-year, or flat in constant currency. Currency fluctuations had a negative impact on revenues of approximately 5%. Permanent placement revenues amounted to EUR 79 million, flat in constant currency. Revenues from counter-cyclical Career Transition (outplacement) totalled EUR 66 million, up 6% in constant currency. Gross profit amounted to EUR 942 million and the gross margin was 18.7%, up 80 bps year-on-year. Temporary staffing had a 75 bps positive impact on the gross margin and the outplacement business added a further 5 bps. Permanent placement and other activities had a neutral effect. Reassessment of the French CICE resulted in an approximately 50 bps benefit to the temporary staffing gross margin in Q3 2013 relating to prior periods. SG&A was EUR 669 million, a 9% decrease compared to Q3 2012. Restructuring costs were EUR 3 million, compared to EUR 22 million in Q3 2012. SG&A excluding restructuring costs was down 2% in constant currency. Sequentially, SG&A was down 1% in constant currency and excluding restructuring costs. FTE employees declined by 5% (-1,700) and the branch network decreased by 7% (-370 branches), compared to Q3 2012. At the end of Q3 2013, the Adecco Group had over 31,000 FTE employees and operated a network of around 5,100 branches. EBITA was EUR 273 million and EBITA excluding restructuring costs was EUR 276 million. The EBITA margin excluding restructuring costs was 5.5% compared to 4.4% in Q3 2012. Approximately 50 bps of this year-on-year increase was due to reassessment of the French CICE relating to prior periods. Amortisation of intangible assets was EUR 10 million. Operating income was EUR 263 million. Interest expense was EUR 20 million. Other income / (expenses), net was positive EUR 1 million in Q3 2013 compared to an expense of EUR 1 million in Q3 2012. The effective tax rate was 22%, compared to 33% in the prior year. In Q3 2013, the tax rate was positively impacted by the successful resolution of prior years’ audits and tax disputes and the expiration of the statute of limitations in several jurisdictions. Net income attributable to Adecco shareholders was EUR 190 million, an increase of 61%. Basic EPS increased by 71% to EUR 1.06, reflecting net income growth and the impact of the share buyback programmes. Cash flow generated from operating activities was EUR 270 million in the first nine months of 2013, compared to EUR 284 million in the same period last year. In the first nine months of 2013, capital expenditure was EUR 53 million and the Group paid dividends of EUR 266 million and paid EUR 276 million for treasury shares. Net debt at September 30, 2013 was EUR 1,284 million, compared with EUR 972 million at December 31, 2012. DSO in Q3 2013 was 54 days, one day less than in Q3 2012. In France, revenues of EUR 1.3 billion were down 5% year-on-year, with the gap to the market continuing to narrow. Permanent placement revenues were down 15%. EBITA was EUR 93 million, which includes restructuring costs of EUR 1 million. EBITA excluding restructuring costs was EUR 94 million, with the margin of 7.4% increasing by 330 bps year-on-year. Approximately 190 bps of the year-on-year increase in EBITA margin was due to reassessment of the French CICE relating to prior periods. In North America, revenues were EUR 950 million, up 3% in constant currency. General Staffing revenues grew 1%, with solid growth in Industrial and a decline in Office, while Professional Staffing revenues grew by 3%, all in constant currency. Permanent placement revenues continued to develop well, up 20% in constant currency. EBITA was EUR 42 million. The EBITA margin was 4.4%, flat compared to the EBITA margin excluding restructuring costs of 4.4% in the prior year. Q3 2013 included an asset writedown, which negatively impacted the EBITA margin by 30 bps. In the UK & Ireland, revenues were EUR 481 million, up 1% in constant currency. Permanent placement revenues were down 6% in constant currency. EBITA was EUR 10 million, impacted by restructuring costs of EUR 1 million. EBITA excluding restructuring costs was EUR 11 million, with the margin of 2.2% increasing by 150 bps year-on-year. Note that Q3 2012 was affected by the London Summer Olympics, with a benefit to revenues but a negative impact on profitability due to sponsorship costs. In Germany & Austria, revenues were EUR 435 million, up 4% compared to Q3 2012. EBITA was EUR 39 million and the EBITA margin was 9.0%, compared to the Q3 2012 EBITA margin excluding restructuring costs of 8.5%. In Japan, revenues were EUR 273 million, down 5% in constant currency. Despite the revenue decline, profitability improved further. EBITA was EUR 18 million and the EBITA margin was 6.5% compared to 6.1% in the prior year. In Italy, revenues were up 8% with a strong EBITA margin of 6.8%, up 110 bps year-on-year. In the Benelux, revenues increased by 3% and the EBITA margin increased by 40 bps year-on-year to 5.5%. In the Nordics, revenues were down -1% in constant currency and the EBITA margin was 4.3% compared to 4.6% in Q3 2012. In Iberia, revenues were up 4%. In Australia & New Zealand, revenues fell by 10% in constant currency. In Switzerland, revenues declined by 4% in constant currency. In the Emerging Markets, revenue growth was 8% in constant currency, with a further acceleration of the strong growth seen in Eastern Europe. The EBITA margin was 3.8%, up 30 bps year-on-year. 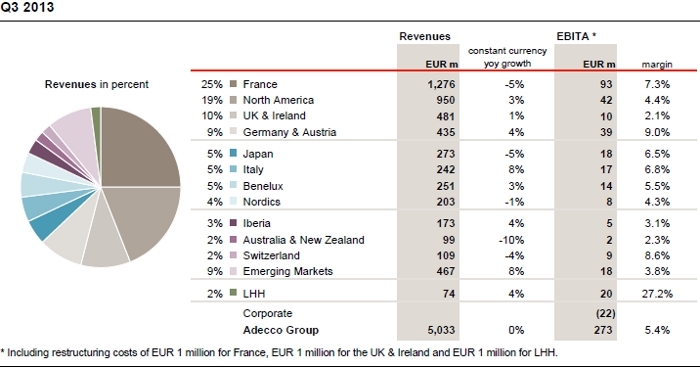 Revenues of LHH, Adecco’s Career Transition and Talent Development business, were up 4% in constant currency to EUR 74 million. EBITA was EUR 20 million, impacted by restructuring costs of EUR 1 million. EBITA excluding restructuring costs was EUR 21 million, with a margin of 27.7% compared to 24.3% in Q3 2012. In General Staffing (Office & Industrial), revenues were EUR 3.8 billion, flat in constant currency. In the Industrial business, revenues were up 1% in constant currency. In France, revenues declined by 4% while revenues grew in Germany & Austria by 5% and in Italy by 9%. North America revenues grew by 7% in constant currency. In the Office business, revenues were down 3% in constant currency. Revenues grew by 9% in Emerging Markets but were down 8% in Japan, down 5% in North America, down 12% in the UK & Ireland and down 4% in the Nordics, all in constant currency. In France, the decline was 8%. Professional Staffing3 revenues were EUR 1.1 billion, up 2% in constant currency. Revenues in North America were up 3%, in the UK & Ireland up 6% and in Japan up 5%, all in constant currency. Revenues fell by 7% in France and by 2% in Germany & Austria. In Information Technology (IT), revenues increased by 4% in constant currency. In North America, revenues grew by 5%, driven by the US IT Professional Staffing business which grew by 8%, both in constant currency. Revenues in the UK & Ireland were up 8% in constant currency. Adecco’s Engineering & Technical (E&T) business was flat in constant currency. In North America, revenues were up 2% in constant currency. In Germany & Austria revenues grew 1%, while in France revenues were up 11%. In the UK & Ireland revenues fell 23% in constant currency. In Finance & Legal (F&L), revenues were up 4% in constant currency. Revenues in North America grew by 4% and in the UK & Ireland by 7%, both in constant currency. Medical & Science (M&S) revenues were down 11% in constant currency. North America declined by 2% and the Nordics declined by 3%, both in constant currency, while revenues in France were down 24%. Solutions4 continued to perform well, with 10% growth in constant currency. Revenue growth in MSP (Managed Service Programmes) and VMS (Vendor Management System) continued to be strong double-digit in constant currency. With most European economies coming out of recession, we expect demand for flexible labour to increase. We have returned to growth in many countries in Europe and the pick-up in Italy, Germany and Spain is especially encouraging. In France the rate of revenue decline has reduced further and North America continues to perform well. Emerging Markets again delivered high-single-digit growth with a further acceleration in Eastern Europe. In constant currency and adjusted for trading days, we exited the quarter with revenues in September down 1% and the Group returned to growth in October. Given these trends, we maintain our price discipline and cost control. At the same time, we continue to invest in organic growth opportunities and the consolidation of our IT platforms, whilst focusing on our strategic priorities. SG&A in Q4 2013 is expected to increase slightly compared to Q3 2013 on a constant currency basis and before one-off costs. As announced in March this year, we plan to invest a total of EUR 30 million in 2013 to further optimise the cost base, of which EUR 16 million was invested in the first 9 months of the year. We continue to be very focused on reaching our EBITA margin target of above 5.5%. Given recent trends and more favourable economic conditions expected from the end of 2013, we remain convinced we will achieve this target by 2015. There will be a media conference call at 9 am CET as well as an analyst conference call at 11 am CET, details of which can be found in the Investor Relations section on our website. Information in this release may involve guidance, expectations, beliefs, plans, intentions or strategies regarding the future. These forward-looking statements involve risks and uncertainties. All forward-looking statements included in this release are based on information available to Adecco S.A. as of the date of this release, and we assume no duty to update any such forward-looking statements. The forward-looking statements in this release are not guarantees of future performance and actual results could differ materially from our current expectations. Numerous factors could cause or contribute to such differences. Factors that could affect the Company’s forward-looking statements include, among other things: global GDP trends and the demand for temporary work; changes in regulation of temporary work; intense competition in the markets in which the Company operates; integration of acquired companies; changes in the Company’s ability to attract and retain qualified internal and external personnel or clients; the potential impact of disruptions related to IT; any adverse developments in existing commercial relationships, disputes or legal and tax proceedings. The Adecco Group, based in Zurich, Switzerland, is the world’s leading provider of HR solutions. With over 31,000 FTE employees and around 5,100 branches, in over 60 countries and territories around the world, Adecco Group offers a wide variety of services, connecting more than 650,000 associates with over 100,000 clients every day. The services offered fall into the broad categories of temporary staffing, permanent placement, career transition and talent development, as well as outsourcing and consulting. The Adecco Group is a Fortune Global 500 company. EBITA is a non US GAAP measure and refers to operating income before amortisation of intangible assets. Net debt is a non US GAAP measure and comprises short-term and long-term debt less cash and cash equivalents and short-term investments. Professional Staffing refers to Adecco’s Information Technology, Engineering & Technical, Finance & Legal, and Medical & Science businesses. Solutions include revenues from Career Transition & Talent Development (CTTD), Managed Service Programmes (MSP), Recruitment Process Outsourcing (RPO) and Vendor Management System (VMS).